Bartering is an exchange of products or services without money and if you wonder if it is legit, of course it is! IRS clarified that. In fact, top notch companies make use of Bartering in their businesses. Today, bartering is easier because after this industry boomed in the 80’s, a lot of third party clubs were willing to organise money free trades in behalf of other parties. There are already several websites that offer this service for free! If barter is money less how do these third parties benefit from it? Well that’s a different discussion but here we will try to enumerate the benefits barter can offer. There are a few materials we purchase for our own use or for our businesses that we eventually have to let go but pre used items have lesser chance of being bought or worse, they become sold at a price lower than their original value. And to be able to get all our money’s worth we have to maximise all the resources we have. Some industries require purchasing new materials and that entails more budget, right? So what happens to old materials that are no longer of use? We store them and when we do, we no longer take advantage of its potential use for our business or personal needs. Bartering allows you to trade those pre used materials with other stuff you might be needing and the best thing is, there is a bigger chance for you to get materials of almost equal value. This way you are able to maximise the money you used for purchasing those items you no longer need! This practice saves you space and money! The internet made this industry easier to perform and manage. Several websites today require to create an account and enables you to connect with several traders online that specialise in different fields and can offer different products and services. One great way to market your business and to build online presence is to connect with different people who can refer you to other people in their network. Of course, when you barter, you are more likely to connect with people within the same industry but there are instances that what you need is from a different source. By engaging in online bartering, you get to meet people who can introduce you to service and product providers who you can partner with even outside the bartering circle. And since it is online, you don’t have to worry about geographical limits. There are two reasons for this: one you get to meet people within your field, within the area that can deliver you your products or services personally or through courier and two, you get to be introduced to their company or industry thus creating your presence in their networks. These are just some of the advantages of bartering for business or for individual traders. 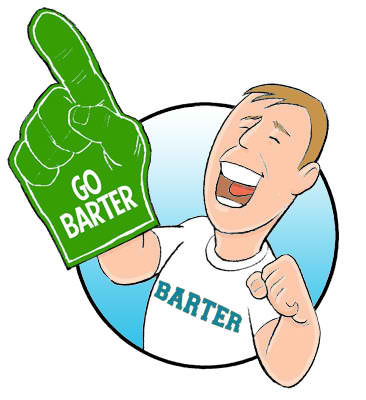 If you also want tips on how to save money (click here) barter can also help you there. ← Coffee Does this to my Body, Really?